In today’s society, many people shy away from traditional medicines and desire to find organic supplements for their symptoms and sicknesses. For this reason, Menopause Tincture would appeal to many women suffering from menopause who want to avoid harmful medicines. Claiming to balance hormones and boost energy, this product carries some of the important elements needed to make the transition into menopause a lot easier. However, if this product is truly effective, why can no reviews be found? Because of the lack of reviews, we must research the elements of this product to deduce its true benefits. Users of Menopause Tincture are encouraged to take 10-15 drops in a little water. However, there is no indication as to when this should be taken, how many times a day it should be taken, or even if users should consume this many drops on a daily basis. This product can be purchased on The Organic Pharmacy’s website for $26.00. With this purchase, customers will receive 50ml of Menopause Tincture. There is no indication that a discount can be received when signing up for an emailing list or buying a larger quantity of this product. When researching this particular product, no guarantee could be found. 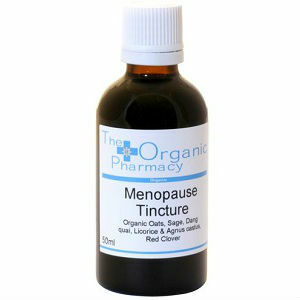 This should be of concern to those considering using Menopause Tincture. If this product fails to be successful, a consumer has lost their investment. A company should always back their product with a guarantee, thus creating a security element for all customers. Although Menopause Tincture does provide customers with the satisfaction of knowing they will be taking an organic supplement, cons to this product put a damper on that factor. The first con concerns the benefits. Although this product does help balance hormones, it is uncertain as to how significantly this will help to reduce the symptoms of menopause. For this reason, many women may be uncertain as to how this product will help and what kind of results they can expect to see. A second issue concerns the lack of a guarantee. When a customer purchases this particular product, they are taking a gamble. If they are not satisfied with the results, they have wasted their money and have no hope of a return on their investment. This creates hesitation for those deliberating a purchase from Organic Pharmacy. Jackie Horowitz	reviewed The Organic Pharmacy Menopause Tincture	on October 27th	 and gave it a rating of 2.